Learn how to build and use a backyard greenhouse. Extend your gardening season and have a better harvest of vegetables, fruit, herbs and flowers. Shelter your seedlings with inexpensive row covers, bell jar cloches and hoop houses. Get started today with these project plans and how-to guides. Hobby Greenhouses Get your garden off to an early start in the Spring and extend the growing season in the Fall. Have a little hobby greenhouse, potting shed or solar shed in your backyard with these prefab structures and do it yourself plans and building kits. 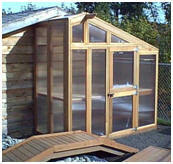 Free Greenhouse Plans Get your garden of to a great start this season. Then extend your harvest into the late fall or early Winter. Build your own hobby greenhouse or cold frames and how to use them efficiently with these free plans and how-to guides. 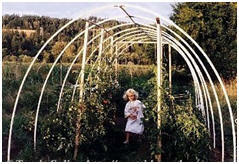 Free Hoop House Plans Build your own simple, inexpensive hoop-style greenhouse. Get your plants under shelter right away. These free plans and building guides will show you how. Free Cold Frame and Garden Row Cover Project Plans Make your garden more productive season in and season out. Learn how to make your own cold frames, hoop-style row covers and bell jar cloches with these free project plans and how-to guides. Free Garden Shed and Potting Shed Plans Choose from a variety of practical and attractive shed designs from top how-to magazines and building product retailers. Build a place to store all of your gardening tools and supplies. Or, choose one of the many potting shed plans and have a sunny, protected space to store tools and to get your seedlings off to an early start each season. 44 Compost Bin and Compost Tumbler Plans and Composting Guides Build your own compost bin or tumbler and learn how to use it to produce "gardener's gold" organic fertilizer from your kitchen scraps and yard clippings. These free project plans and how-to guides are just what you need. 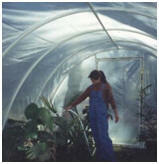 How to Build a Greenhouse Build your own greenhouse and have a practical, year-round outbuilding. Shelter your garden tools and supplies in winter. Get a springtime head start to a bountiful garden. Then, extend your growing season into the late fall for extra vegetables, fruit, herbs and flowers. These small greenhouse do-it-yourself plans and kits will help you build your own. Get Free Solar or Wind-Powered Electricity Take advantage of free energy from the sun and wind. Learn how to build your own inexpensive wind turbine generators and solar panels Get do it yourself plans and step by step building instructions. Plans and guides from Earth4Energy.com come by instant download with a complete money-back guarantee. .
Find Your New Shed Visit BackroadHome.net to view hundreds of sheds, shed blueprints, do-it-yourself shed project plans and shed building kits. Find garden sheds, tool sheds, lawn mower garages, solar sheds, storage sheds, pool houses, cabanas and playhouses. Choose from hundreds of designs from top North American designers, manufacturers and retailers.